1. Clean out your old backyard shed—or use a kit to build a new one. Have you been conveniently "forgetting" to clean out that cluttered shed? Creating a she shed is the perfect motivation for finally getting it done. Go through all those old garden tools and boxes, then donate what you don't need anymore and organize the rest for storage. Don't have an old shed already sitting around your backyard? You can buy an easy-to-build kit at your local tool store. Want to go all out? 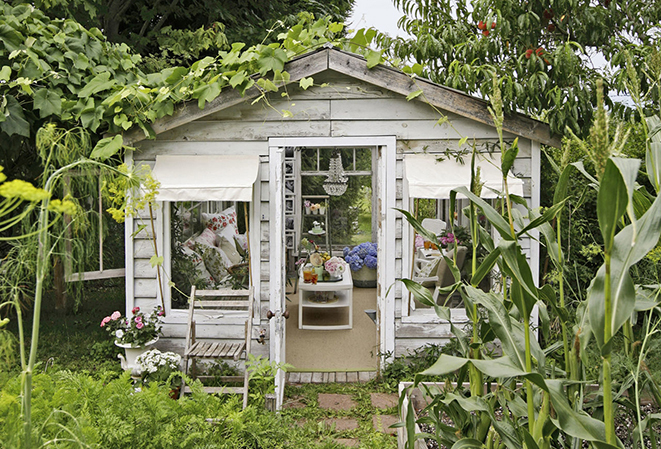 Choose a shed with whimsical structural details. 2. 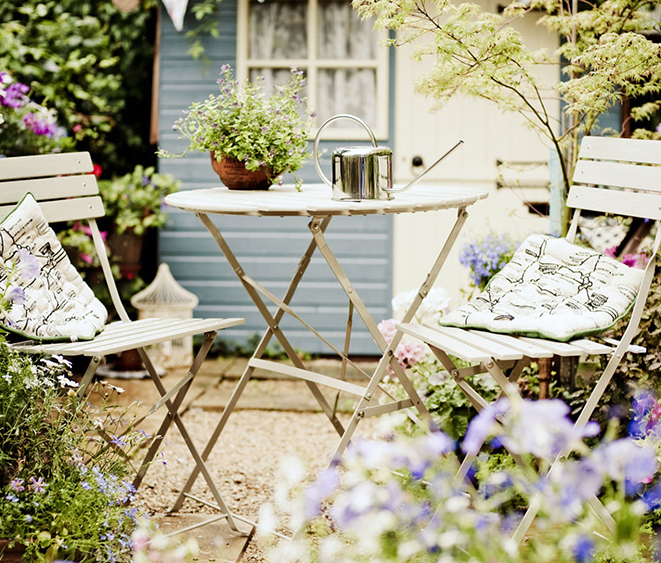 Give your shed a fresh coat of paint. 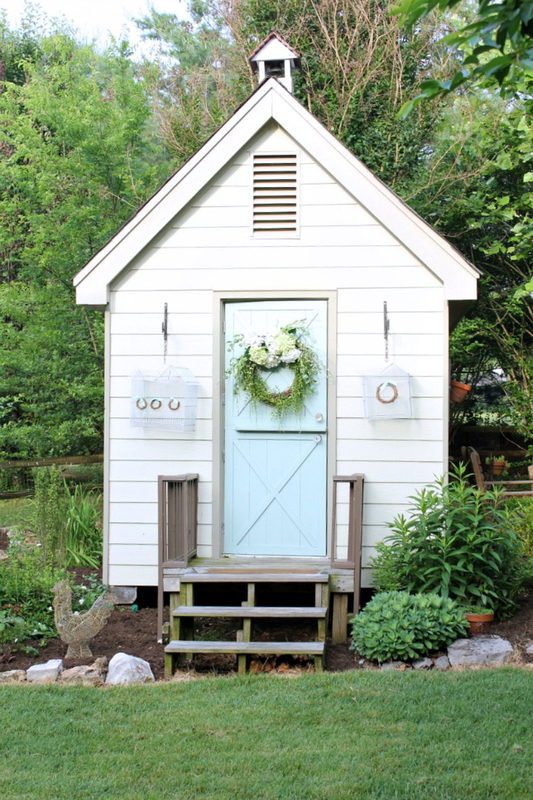 Taking your shed from ordinary to oh-so-cute starts with the exterior. Paint it a calming color like light blue, or a feminine shade of purple or light yellow, will instantly give it new life. Of course, white is always a classic color choice—Hometalk blogger Daisy added a pale blue door to her white craft shed (also a former child's playhouse) to make the space extra welcoming. 3. Define the purpose of your shed. The point of a she shed is to have a quiet space that allows you to embrace a hobby that's important to you. Hometalk blogger Judy took advantage of her backyard location by using it as a potting shed, where she spends time gardening. 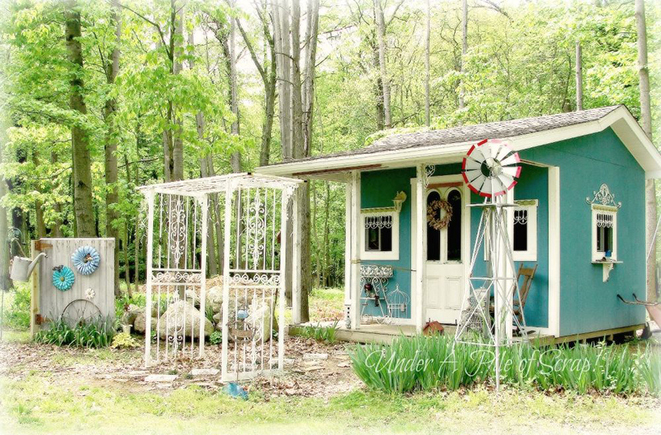 If you're not an avid crafter or gardener, your she shed can simply be used as a quaint place to hang out. 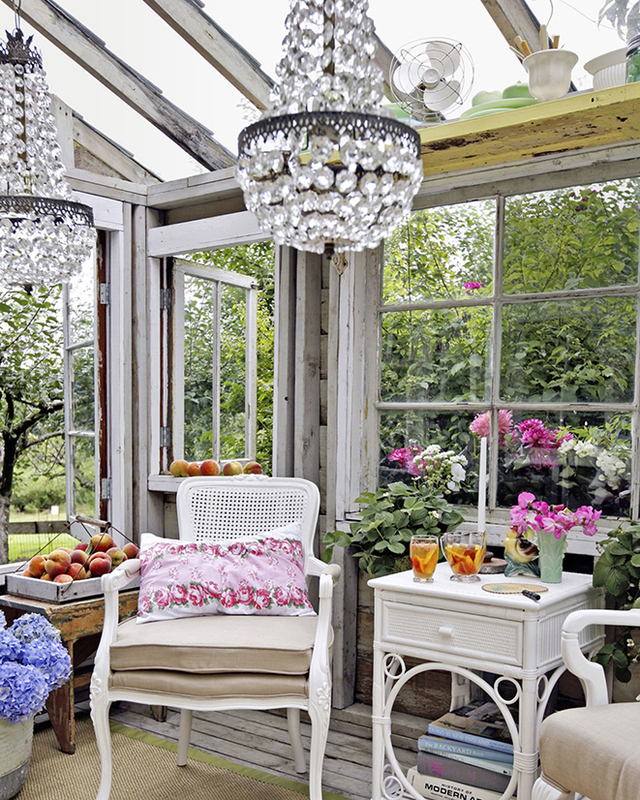 Heather Cameron's husband transformed a neglected potting shed on their property into a pretty greenhouse-style retreat, pictured above. "I never had time to use the shed for its original purpose as a place to pot plants," she says. "I like it much more now as somewhere to escape to and curl up with a good book, paint, or visit with friends." 4. Search flea markets and antique shops for unique finds. 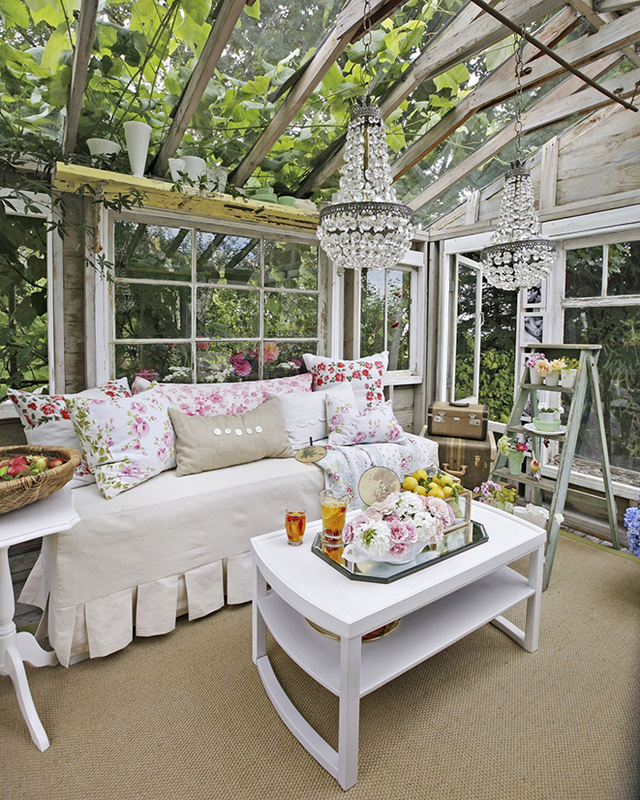 Decorating a she shed isn't about spending lots of money—it's about creating a space that feels relaxed and cozy. So look to flea markets and antique shops for unexpected finds. Inside Heather's shed, she added overhead shelves repurposed from an old door she found for $15 as a place to display her vintage jadeite and milk glass collection. (She cut the door in half lengthwise and placed the pieces on brackets.) She also refreshed thrift store chairs with a coat of white paint and seats re-covered in natural linen. 5. Surround yourself with nature. It's all about environment! 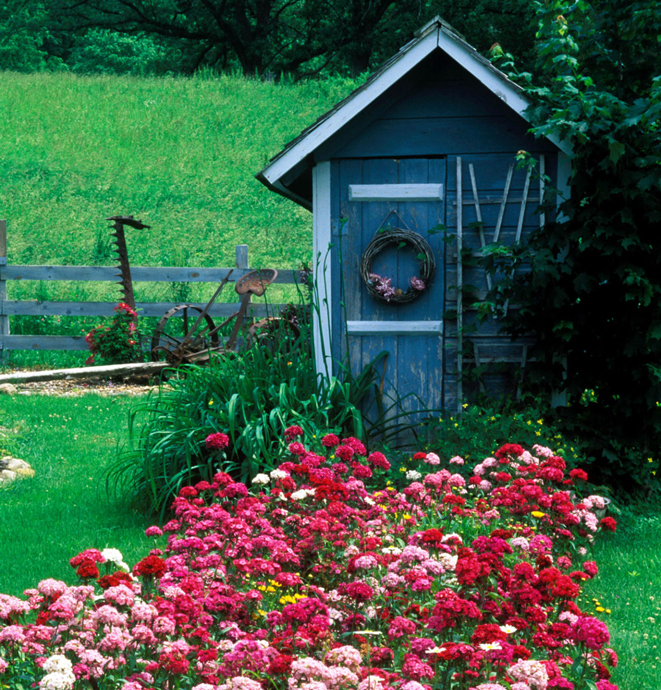 Placing your shed in a secluded spot and surrounding it with grassy plants, vines, and window boxes full of flowers helps create a tranquil vibe, all the better for establishing a calm place to get some thinking done. 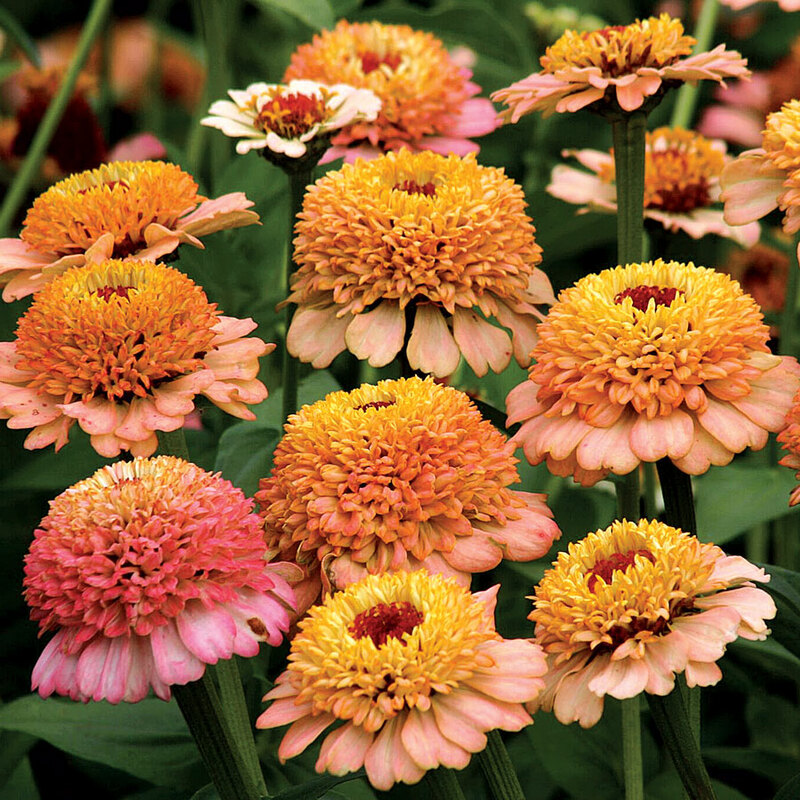 Bring the garden inside as well, by decorating with plants, freshly picked flower arrangements, and plush pillows featuring feminine floral patterns. 6. Create an inviting entryway. She sheds should have an inviting look, especially if you're hoping to entertain friends there. Hometalk blogger Beth made an arbor, pictured above, using storm doors. You could also decorate the exterior with romantic outdoor curtains, white string lights, or hanging DIY lanterns. 7. Make sure your shed is a reflection of yourself. As your hobbies and aesthetics change, update your shed to reflect them—after all, it's your space! It should transform with you. And of course we can't forget the best tip of all: There are no rules when it comes to creating the perfect she shed—it's all about you being you.